Editor's note: Today’s guest blogger is Ian Kalin, Director of Open Data at Socrata, a provider of cloud-based software that helps public sector organizations increase transparency, improve citizen service and make data-driven decisions. Ian is a former U.S. Navy Officer and White House Presidential Innovation Fellow who led open data projects for the U.S. Department of Energy. See how other forward-thinking organizations are investing in mapping technology and transforming their business: Maps are Going Google. As a former government employee, I know firsthand that there is tons of valuable data locked away in databases and spreadsheets on government computers; data that may never see the light of day. Until recently there was no easy way for citizens to view, use and share that information. Now, technology is liberating data so organizations can use it in new ways. Socrata publishes its geospatial datasets onto Google Maps Gallery to make it easier to discover and use public sector maps. Before using Maps Gallery, people would have to do separate online searches for different types of information, and hope that it was in a web-browser friendly format. Then they would have to visualize all the data points on a map. Now that we’ve added maps to Google Maps Gallery, users don’t need sophisticated technical skills to get to the data and make it actionable. They can more quickly find answers to their questions — such as, where should I open a restaurant? or which neighborhood should I move into? — then personalize the information to their needs, and make informed decisions. Using the Socrata platform, the City of Chicago has published several helpful maps on Google Maps Gallery for its residents. 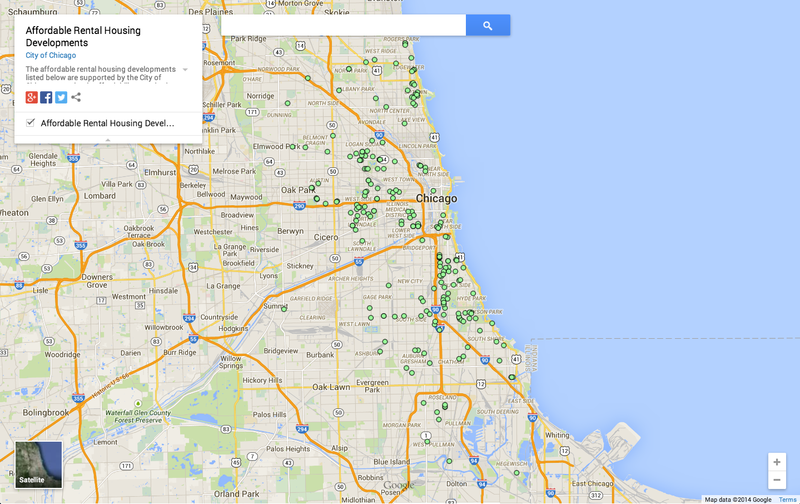 This map shows locations of affordable housing developments with contact information for potential renters. We’re seeing all sorts of exciting things happen with open data projects like these. Governments are becoming more transparent and providing better service to the public, enabling citizens to access and consume information in more useful and beneficial ways. Our partnership with Google Maps means that even more data will be opened up and easier to consume. Displayed on the web’s most popular mapping interface, we’re one step further in ensuring that valuable data is in the hands of the people who need it most.